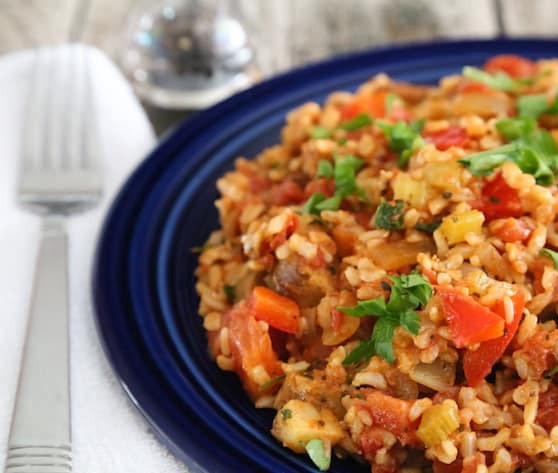 Spicy bits of vegan sausage lend an authentic flair to this simple vegan take on Jambalaya, a Creole-Cajun classic. Serve with any type of coleslaw and fresh corn bread for a hearty, satisfying dinner. Photos by Evan Atlas. 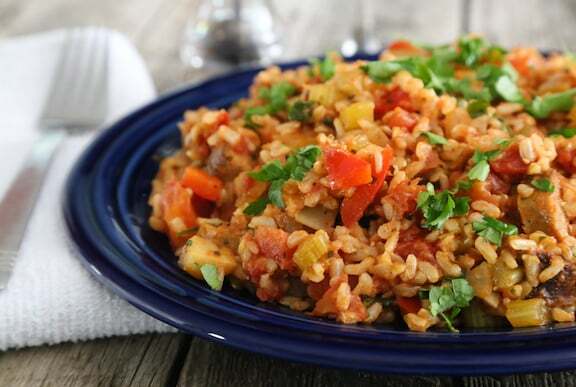 Spicy bits of vegan sausage lend an authentic flair to this simple vegan take on Jambalaya, a Creole-Cajun classic. Bring 2½ cups water to a simmer in a saucepan. Stir in the rice; cover and cook at a gentle, steady simmer until the water is absorbed, about 35 minutes. Slice the sausage links ¼ inch thick. Heat just enough of the oil to lightly coat the bottom of a large, nonstick skillet. Cook the sliced sausages ver medium-high heat, gently turning them until all sides are golden brown. Remove from the heat and set aside until needed. Heat the remaining oil in the same skillet. Add the onion and sauté over medium heat until translucent. Add the garlic, celery, and bell pepper, and continue to sauté until all the vegetables are lightly browned. Add the remaining ingredients except the salt. Bring to a simmer, then cover and simmer gently for 15 to 20 minutes. 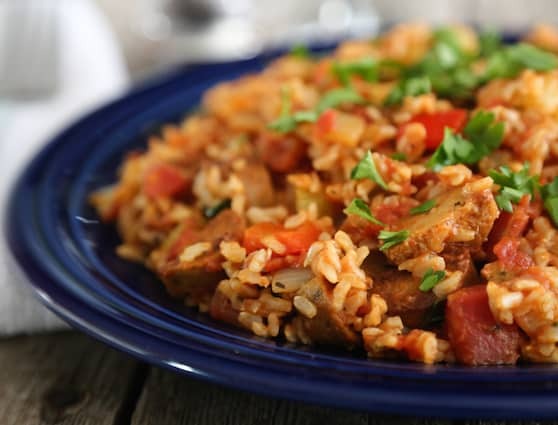 Combine the skillet mixture with the hot cooked rice and sausage pieces in a large serving bowl and toss together thoroughly. Season to taste with salt (and a bit more cayenne if you’d like a spicier dish) and serve at once. Here are more vegan sausage recipes. Very tasty!! I increased the spices and garlic for more flavor. I cooked my rice in my rice cooker to reduce cooking time. I made cole slaw from Healthy Happy Life: http://kblog.lunchboxbunch.com/2009/03/recipe-healthy-cole-slaw-vegan.html and it was delicious too! I made this for the children, it smelled & Tasted GREAT! We like is spicy over here so I had to kick it up a few notches with some saute peppers! I feel determined to eat vegetarian without tofu. This dish sounds great, I am using slices of avocado instead. Scott, this isn’t exactly with tofu; it’s made with vegan sausage, which, if you use Tofurky or Field Roast has a nice spicy flavor and adds interesting texture to the dish. If you try it, let us know how you like it! I have a huge problem with textures of food (it’s all in my mind). How is the texture of tofurky or the vegan sausage? I’m thinking about adding mushrooms instead. Thank you in advanced Stephen. Hi Stephen, the vegan sausage has a kind of chewy texture, not unpleasant, but that’s subjective. If you enjoy the taste and texture of mushrooms, go ahead and used them instead. I think they’d work well in this recipe. If subbing the sausage out definitely try the mushrooms, portobello or those baby bellas or heck even the plain white mushrooms (they are the best price after all!) After cleaning and chopping I would put them in a bag to marinate for a bit (balsamic & soy) including thyme maybe and some spices from the dish in it along with a few sprinkles of liquid smoke. This gives a nice texture, meaty flavor, and a bit of that smoke flavor that might be included in the sausage. If you don’t like it smokey just leave that part out. Amazing and thank you for sharing this recipe! Just tried this recipe last night and it was delicious! I didn’t have celery or some of the spices so I improvised and it turned out awesome!! I also didn’t use all the Tofurky sausage, I used about 3/4 of it because I thought it was too much. I’ve had two bowls today! Thank you so much!! !